Talking about the weather may be the ultimate sign that an awkward conversation is going nowhere. Nevertheless, most of us think about the weather often enough that we want to know what it's going to be like outside on any given day. In the summer, you want to know when it's going to be boiling hot. In the winter, you need to know when to wear that extra layer. In the spring, you always want to know the rain forecast, so you have someone to blame for getting soaked after leaving your umbrella at home. Windows 8.1 users that like the modern UI have it easy since they are many weather apps with live tiles that deliver quick updates. But if you're one of the weather obsessed masses living solely on the desktop, you can still keep tabs on the weather. Here's a quick look at three ways to have the current temperature and forecast always at hand on the desktop. 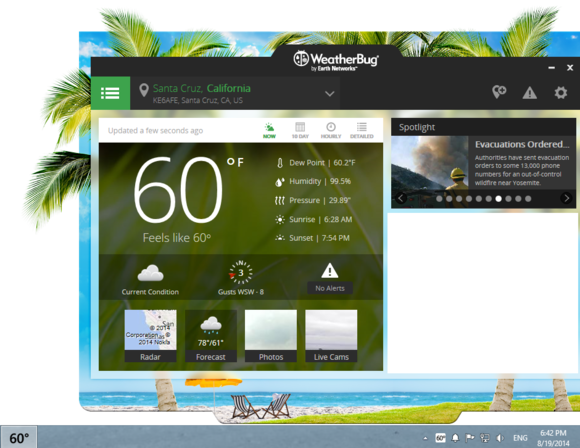 Weatherbug delivers the weather to your desktop with a simple app and notification icon. There are several desktop apps that put the weather in your system tray/notifications area. The one I have had the most success with is Weatherbug, which sits in your notifications area constantly displaying the current temperature. When you first install Weatherbug, you may have to drag it into the system tray by clicking on the upward facing arrow on the right-hand side of the taskbar. In the pop-up window, just drag-and-drop the weather icon onto the notifications area. If you need a larger icon, just leave Weatherbug running and minimize the window to the taskbar as the app displays the current weather instead of a taskbar icon. The one thing to watch out for with Weatherbug is that it attempts to install a potentially unwanted program (PUP). It will try to install the Ask.com toolbar into your browser and change your default search engine to Ask. To avoid this switch, just press cancel when the screen with these options appears, or try using Unchecky. The Detox skin for Rainmeter. Windows 8 and 8.1 doesn't have the built-in widgets feature that Windows 7 and 8 users do, but if widgets are your thing give Rainmeter a try. If you've never heard of it, Rainmeter is a desktop widget utility that can display all kinds of useful information on your desktop such as CPU temperature, network graphs, new headlines, and the current weather. If you've never used Rainmeter before, it takes a little getting used to, but it's not all that difficult. Check out our tutorial on how to Supercharge your desktop with Rainmeter widgets to get started. Once you're up and running, there are several nice skins and suites you can try out for weather displays including the basic Enigma skin that comes with Rainmeter as well as Detox, Lim!t, and myHUDS Futura 4.0. Weather by 64px. 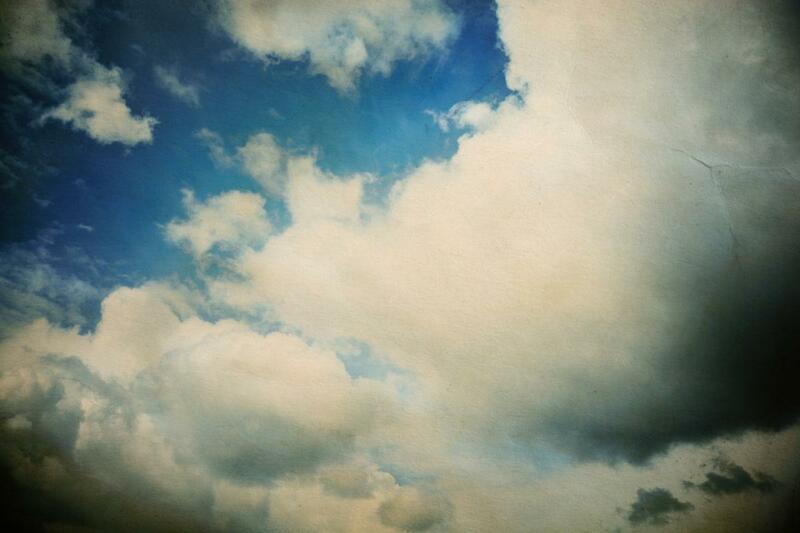 is a simple Chrome extension for weather updates. If you spend most of your day in the browser, then a browser extension that constantly displays the current temperature might make more sense for you. 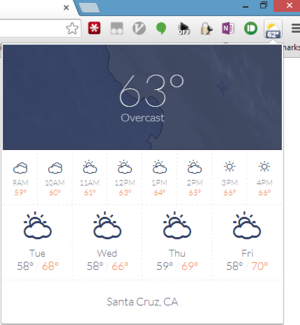 A very nice choice for Chrome is Weather by 64px. A very simple and easy to understand extension, it auto-detects your location and displays the current temperature. Click the icon and you get an hourly breakdown of today's weather as well as a four-day forecast. This extension's Weather data comes from Weather Underground. I'm not a huge fan of the current crop of Firefox extensions, but Aniweather is an interesting choice. It offers a ton of information, but it also takes up a lot of space on the toolbar. While the weather is not the most exciting topic of conversation, it's always handy to have basic forecast and temperature information at hand, whether it's in a widget, on the taskbar, or sitting in your browser.